183 pages | 11 Color Illus. | 108 B/W Illus. "This book provides a practical description of optics that satisfies the needs often encountered by some engineers in the practice of their profession. Optical components, including optical sources and detectors, have found their way into products that we buy for the house, and into industrial equipment. As a textbook, it provides an efficient tool for the student to gain in-depth knowledge of a subject, with homework problems to test and verify mastery of the subject." "This book covers all the experimental tools, described meticulously and with clear illustrations, which students will need to perform their experiments. I wish I had this book when I taught an optics course!" 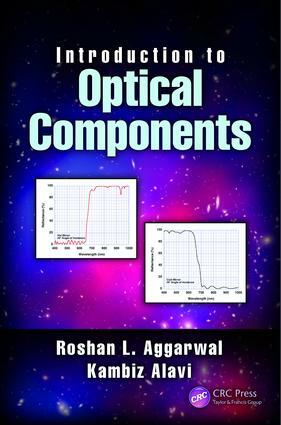 This book provides readers with a brief introduction to optical components. Materials presented in this book prepare readers to deal with optical components in the areas of optics and optical technology. Introduction to Optical Components features nine chapters with topics ranging from lenses (materials, magnifiers, and cameras); mirrors (spherical, ellipsoidal, and aberrations); diffraction gratings (holographic and multilayer dielectric); polarizers (birefringent, reflective, and Jones matrix algebra); windows (UV and AR coating materials); filters (neutral density and Raman); beamsplitters (plate, cube, and pellicle); sources (light-emitting diodes and lasers); and detectors (thermal, photon, and photodetector noise). This text also features a detailed discussion of non-ideal effects for practical components using minimal amounts of derivations (that do not compromise essential physical, mathematical, or material properties). While there are numerous books that feature "optical" in their title, to date, no textbook on optical components exists. It is for this reason that Introduction to Optical Components is such a vital resource. The technical level of this book is equivalent to an undergraduate course in the optics and optical technology curriculum. Students are required to have little familiarity with optics. Practitioners in optics and optical technology will also find this book useful. Each chapter includes numerous mathematical equations; tables providing useful optical parameters for many optical materials; and end-of-chapter questions and their corresponding solutions. "This book provides a practical description of optics that satisfies the needs often encountered by some engineers in the practice of their profession. Optical components, included optical sources and detectors, have found their way in products that we buy for the house, and in industrial equipment. As a textbook, it provides an efficient tool for the student to gain in-depth knowledge of a subject, with homework problems to test and verify mastering of the subject." "This book covers all the experimental tools, described meticulously and with clear illustrations, which the students will need to perform their experiments. I wish I had this book when I taught an Optics course!" "Introduction to Optical Components is concise and well written. To my knowledge this is the first textbook on optical components, and it presents an attractive alternative to standard engineering and physics textbooks that struggle to communicate both theory and applications of optical phenomena and simply are not able to effectively cover the foundations for optical components in everyday engineering systems." "This book is in the form of a textbook for an undergraduate course in optics and technology. It is concise, free of mathematical derivations and contains several tables providing a huge number of optical parameters which may be useful for optical design engineers as well. An appendix with the solutions to homework problems is also included at the end. The book is organized and well written, both as textbook for students and a brief handbook for optical engineers." Roshan L. Aggarwal retired from Massachusetts Institute of Technology (MIT) in 2016 after 51 years of service. He is currently working as Part-Time Flexible Technical Staff in Group 81 "Chemical, Microsystem, and Nanoscale Technologies" at MIT Lincoln Laboratory. Previously, he was Technical Staff at MIT Lincoln Laboratory for 30 years (1986-2016), Senior Research Scientist, MIT Physics Department for 12 years (1975-1987), Associate Director, MIT Francis Bitter National Magnet Laboratory for 7 years (1977-1984), and Technical Staff, MIT Francis Bitter National Magnet Laboratory for 12 years (1965-1977). Kambiz Alavi is Professor and Associate Chairman, Electrical Engineering, University of Texas at Arlington, since 2008 and has served at UTA for 27 years. He was a Research Scientist at Siemens Corporate Research at Princeton, NJ (1983-1988) and a Postdoctoral Member of Technical Staff at AT&T Bell Laboratories in Murray Hill, NJ (1981-1983). He served as Site Director of NSF Industry/University Cooperative Research Center (CEMDAS) at UTA (1995-1997). During 2001-2003 he was a Department Manager in Integrated Optoelectronics, Advanced Systems and Technology, BAE Systems, Nashua, NH. He received SB, SM, and PhD degrees in Physics from MIT. His research was conducted at MIT Francis Bitter National Magnet Laboratory.